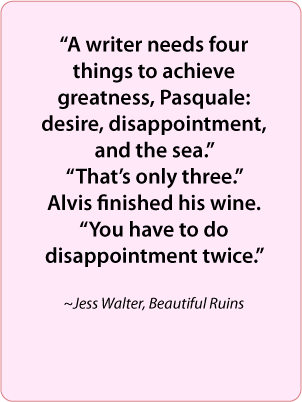 Writers can learn a lot from reading Beautiful Ruins by Jess Walker. In addition to containing a treasure trove of writing techniques to study, it also discusses the process — from writing a novel to pitching to agents — in a wryly humorous way. Summary of main plot: Touted both as literary fiction and a historical romance, Beautiful Ruins follows the lives of five people, including Pasquale Tursi and a young movie star named Dee Moray, who meet by chance in an Italian village. Years later Pasquale comes to Hollywood to find her. The novel has been called historical romance, but it isn’t like most romance novels. It is more about multiple facets of relationships of several characters through a lifetime than a single romance as a major plot line. In the video below, Jess Walter says the novel is a collection of “celebrations of moments,” which seems more appropriate. Although it does have elements of literary fiction, the novel doesn’t check all those boxes either. It could be labeled as epistolary novel, because it contains excerpts of letters, novels, and screenplays, but only here and there. So, perhaps it should be called a partially epistolary novel with literary elements. Story lines diverge and converge through place and time throughout the book, so it is hard to define one main character. Instead there are several characters who play important roles: Italian Pasquale Tursi, American actress Dee Moray, a fictionalized version of actor Richard Burton, film producer Michael Deane, his assistant Claire Silver, and writer Shane Wheeler. Orenzio continues on with a series of inventive and warmly affectionate slurs against his friend as serious Pasquale interrogates him about the actress. It is a joy to read. The characters travel throughout the world, but the two main settings are a small coastal village in Italy and Hollywood, California. Other locations in the novel include Edinburgh, Scotland; Seattle, Washington; Florence, Italy; Portland, Oregon; Truckee, California; and Sandpoint, Idaho. The descriptions of Italy are particularly luscious. In the video below, Jess Walter explains his wife is of Italian descent, and how the visceral reactions he had when she took him to visit Italy were incorporated into the book. Jess Walter’s responses in this video are full of insights for writers. It is worth the time to watch if you’ve ever thought of becoming a novelist. Floating just under the surface for the most part, but popping up here and there are gems of information about writing. Some of it is in the words themselves. In addition to the pitch-perfect dialogue, Walter mixes things up with style and tone. He writes in present tense in some places and past tense in others. Most of the narrative is in third person point of view, but the first person point of view is included, too. Beginning writers could almost use the novel as a textbook to investigate different elements of writing. Jess Walter also dabbles in metafiction. Screenwriter Shane Wheeler’s experiences with pitching a movie in many ways mirror pitching a novel to a literary agent. Alvis, a novelist who keeps re-writing the same chapter, may reflect some of the author’s personal struggles. As Jess Walter reveals in the video, it took him 15 years to write and publish Beautiful Ruins. He “hit a stone wall,” put it aside, and then picked it up again later when he had matured as a writer, or had ideas for revising and moving past the problems. Having hit a few walls myself, it was helpful to realize that bestselling authors have overcome the same hurtles. All in all, Beautiful Ruins has much to offer to readers and writers, alike. If nothing else, it is likely to inspire people to take a trip to Italy.